I've never met my fellow Now Smell This writer Kevin "in real life," but I feel as though we've been friends for years — not only because we're familiar with each others' fragrance tastes and we've read each others' writing for so long, but because we share other, non-perfume interests and opinions as well. One of them is a background in art history. Another is a strong dislike of hot summer weather. Kevin's recent post on two fragrances for heatwaves suggested one scent-strategy for coping with soaring temperatures: "merging" with the oppressive weather by wearing intense, vivid scents. As I was testing Blackbird's Broken Glass this week, I thought of another: wearing a fragrance that foreshadows autumn. Broken Glass was developed by Blackbird's in-house perfumer, Aaron Way. Its composition includes notes of jasmine, geranium, rose, opopanax, amyris, angelica root, violet leaf, chamomile, davana, bitter almond, cardamom and pink pepper, and it's inspired by the effect of bright light shining through shards of glass. That description made me expect a cool, spiky fragrance, but Broken Glass feels warm and comfortably enveloping instead. I'm guessing that it might include a generous dose of natural ingredients: its resins, in particular, are smooth and aromatic. To me, Broken Glass is primarily a balsamic-woodsy fragrance with hints of spice. Its florals (yes, rose!) are very subtle and dusky, and the tonka adds a touch of nutty sweetness in the base. Overall, Broken Glass has moderate staying power and sillage, and it feels quite androgynous. Going back to its name, this fragrance does remind me of broken glass, after all — if the glass in question was originally an old window with thick, slightly distorted panes, and the light is passing through its shattered surfaces onto a well-worn wood-plank floor. It's not the type of thing I often wear, and it's not as "me" as Blackbird's cool and vaguely ethereal Triton, but I've drained my sample vial and I enjoyed it very much. Quick poll: which "autumn fragrance" do you look forward to wearing? 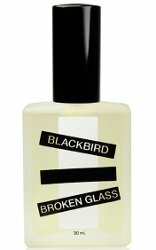 Blackbird Broken Glass is available as a 10 ml roll-on ($38) and a 30 ml atomizer ($88) via the Blackbird website. Samples are also available. Autumnal perfumes are my very favorites and I can’t wait to pull out Safran Trublant, Botrytis, I also have some Frapin samples, Back to Black, Bois de Violette (that just feels like a cozy rainy day to me). I could go on and on! Frapin is a perfect line for autumn! Lots of boozy-woodsy goodness there. Also, Broken Glass sounds interesting. Thanks for review, Jessica! Enjoy your exploration! ST is perfect for the summer-to-fall transition, isn’t it? thank yuou for the review. I haven’t tried any Blackbird. Bois de Violette, Coco parfum, and L’Heure Bleu are three I am looking forward to wearing when it cools down a little, though here in South Florida fall is more of an attitude than a real weather change. Oh, nice picks!! “more of an attitude’ — lol. Their incense is very nice! I liked a few of the scents I sampled. I need to spend more time trying Bois 1920…maybe this is the moment! Autumn encompasses a wide spectrum of weather in the DC area, from highs in the 80s to first snowfall. I look forward to AG Eau du Sud for late summer/early autumn, then MPG Racine, L’AP Timbuktu, Guerlain Vol de Nuit, BK Liaisons Dangereuses, and SSS Tabac Aurea, finishing up with Etro Messe de Minuit for late fall. Sonoma Scent Studio is another good line for fall — quite a few smoky-woody things, and some dusky roses too! Triton and I really, really, really were not compatible (which is a shame), but this one sounds nice, and worth a sample. Despite the fact that it’s hot here in the summer, I’ve been sneaking in wearings of some of my fall/winter scents in low doses: Shalimar, Black Cashmere, Tea for Two, Safran Troublant. One that I’m really waiting for, though, is SSS Winter Woods. Maybe that’s more of a winter scent, but it’s coming out of the drawer as soon as I can get away with it. I’m really looking forward to wearing L’Artisan’s Tea for Two again. It’s the perfect fall fragrance in my opinion! I love living in Southern California (traffic/cost aside), but I do miss the actual seasons changing, especially fall. Another hot weather hater here. I turn into a sweaty, cranky mess in the heat. But I love everything about the fall – the weather, the leaves, the food, the clothes! I always look forward to wearing all my woodsy scents in the fall – Bois des Iles, Santal Massoia, Vetiver Tonka. This fall I’m looking forward to wearing Palissandre d’Or. I’ve been wearing it this summer because I love it too much to wait. But I think it’ll be magical on a chilly fall day. I don’t have any specific autumn scents but I wish to join the “hot weather haters” here. Loathe it. Makes me feel sick. My favourite time of the year is spring. All those bulb flowers! I do not divide fragrances strictly by seasons, but some perfumes are difficult to wear in heat and some match the autumn style and mood better from an aesthetic point of view. So I look forward to wearing Mitsouko, Fille en Aiguilles, Une Rose Chypree, Knowing, Yvresse… Cipresso di Toscana for late August/early September, Frapin Nevermore for late autumn. I love hot weather! I’m a South Florida boy through & through. Conversely, I hate bitter cold weather- really any weather that requires me to wear anything warmer than a light hoodie. Being forced to break out the winter coat makes me depressed. I’m definitely SAD prone. That said, the somewhat cooler temps of autumn can be lovely & I look forward to breaking out Vero.Profumo’s .onda. & .kiki. Also, Donna Karan’s Gold will replace Serge Luten’s Un Lys as my lily of choice. The Guerlains Mitsouko & L’Heure Bleue will come out & Chanel No 5 will again perfume my dreams & my pillows at bedtime.